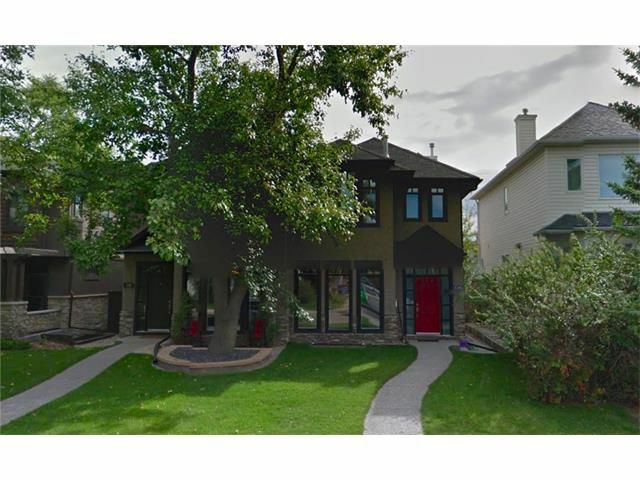 Conveniently located just steps from river pathways and is close to U of C, Edworthy Park, DT, Foothills & Children’s Hospital. This beautiful custom built home has many upgrades including 9’ ceilings, multiple skylights, vaulted ceilings, built in speakers, & rich cherry hardwood flooring & cabinets. The main floor has a formal dining room, living room with corner fireplace & French doors to the back deck, large mud room, & kitchen with granite counters, SS appliances, gas stove, wine fridge, garburator, corner pantry, & raised eating bar. A spiraled staircase brings you upstairs where you will find a spa like master retreat that features a 3-sided fireplace, wall built-ins, walk in closet with shelving, large soaker tub, dual sinks, spacious shower with db shower heads, linen closet, & lots of cabinet space. 2nd master bedroom has a fireplace, wall built-ins, & 5 pc en suite. Fully finished basement features a 4th fireplace in the family room, wet bar with bar fridge, 3rd bedroom, in floor heat throughout, 4 pc bath with steam shower, & laundry. Large deck is great for entertain and has a gas line. Double detached garage completes this must-see property!